Four of the original Chuck Taylor II low tops. Like many sequels, the Chuck Taylor II was kind of a letdown. With a lot of fanfare last July, Converse released a more expensive version of the classic Chuck Taylor, the first major overhaul of the world’s most iconic and best-selling sneaker. The big pitch was a more comfortable shoe, with Nike’s patented bouncy foam in the soles, and a slick new look. After a little more than a year, the upgrade has been a flop. Converse couldn’t make a persuasive case for the premium price, and demand for the shoe has fallen short of expectations, according to people familiar with sales figures. Converse sales overall have slid 1.4 percent to $1.96 billion — after averaging 15 percent growth the past four years. As demand for the Chuck Taylor II weakened, Nike announced in April that longtime executive Davide Grasso would replace Jim Calhoun as chief executive officer of Converse. A spokeswoman for Converse declined to comment. Investors will get more insight into how the brand is doing on Tuesday when Nike reports quarterly results after the market closes. Chuck Taylors, which began a century ago as cutting-edge basketball sneakers, have in the last 40 years become a rare fashion staple that cut across age, race, gender and subculture. Actors and musicians as diverse as Winona Ryder, Bruce Hornsby, Joey Ramone, Justin Bieber and Kesha have all been photographed in chucks. The popularity has been a boon to Nike, which was able to take an already-popular shoe and push it to a global distribution network. Before Nike acquired the brand in 2003, annual sales were around $200 million. Today, they’re close to $2 billion. Still, last year Calhoun said Converse needed to do more than releasing Chucks in new colors or in special-edition collaborations with artists. Its core teenage customer had come to expect innovation and technology, he said. A new version also gave the brand a chance to charge more. Chuck Taylor All-Star low-tops start at $50 on Converse’s website, a price point that hasn’t changed much in the last five years. 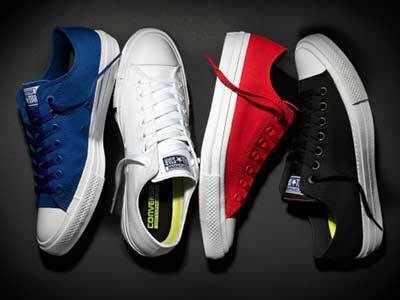 The Chuck IIs started at $75, a 50 percent price increase. There’s one with mesh-backed leather for $100. Another with water-resistant canvas sells for $110. As the world’s largest athletic brand, Nike was able to push the Chuck II to its retail partners, the people said. Now they can be found at deep discounts: 53 percent off at Foot Locker, 40 percent off at Nordstrom. Nike.com, which hosts Converse’s online store, also has some versions on clearance. A recent weekday at a Manhattan Journeys store, a shoe chain that caters to teens and 20-somethings, assistant manager Simon Mendez said he has struggled to sell the Chuck IIs since their debut. One of the biggest gripes Peterson, the uber fan, heard is that the company removed the lines on the toe and along the sole — what are affectionately called racing stripes. Mendez, the store manager, has gotten the same complaints.